Great British Beef Week, now in its ninth year, runs from 1st – 7th April 2019. It aims to champion home-produced beef as part of a balanced, healthy global diet, and to highlight the associated environmental and nutritional benefits it can bring. It puts the spotlight firmly on the fantastic food that British beef farmers produce. In addition, it raises vital funds for those in need in the farming industry by partnering with the Royal Agricultural Benevolent Institution (R.A.B.I.). It’s also a lot closer to home than you might think. A few miles from the Otter Vale kitchen, is Fortescue Farm, where the Greed family graze their herd of suckler beef cows and young stock along the rivers Exe and Culm. Alongside this and overseeing her own PR and marketing business, Jilly Greed is a co-founder of Ladies in Beef, who coordinate GBBW. Her family farm also works with the Westcountry Rivers Trust, one of the two charities Otter Vale is supporting throughout our 40th anniversary year, so we had to find out more about Jilly’s passion for her family, her farm and landscape, and British beef. Flexing mental and physical muscles to adapt to changing times is an approach which seems to have served the farm and family well. Son George represents the fifth generation of the family farming, although the wider family has been farming in East Devon for seven generations. Alongside Jilly’s husband Edwin, George continues to bring new ideas and suggestions to keep the farm thriving; overseeing the cattle, pasture, lands and rivers in their care. 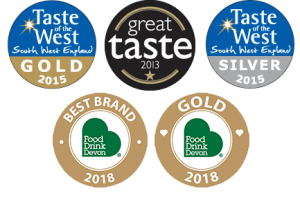 Yes, we might be a tad biased, but it’s hard to argue with taste! The Greeds farm a suckler herd, where the calves stay with their mothers until they are weaned. The herd is made up of around 250 cows and youngsters, grazing 200 acres of water meadow. Jilly tells us that the cattle are a mixture of pure bred and crosses of three particular breeds, to get the best converters of grass to beef. The South Devon is a native breed, renowned for being hardy, a good temperament, making excellent mothers and an almost-unrivalled ability to convert energy from our “interesting” (i.e. difficult to grow/cultivate crops on) terrain here in the south west into muscle. The Blonde d’Aquitaine, a popular breed originating from south western France, is a faster-maturing breed highly regarded for its quality lean beef. More recently, they have introduced the lovely Aberdeen Angus, another native and hardy breed well adapted to poorer quality grazing, producing great mothers and wonderful beef. The family has invested in protecting their soil and rivers running through their farm; working with conservation bodies in projects to improve the water quality and enhance the environment. This helps create habitats in which worms, insects, small mammals, hares and owls can thrive. Over the last three years, the farm has transitioned to a zero tillage (no ploughing) and grass-based “mob grazing system”. This means the cattle spend the best part of the year out at grass, on lush river meadows, moving from paddock to paddock to ensure the best use of grass whilst protecting the soil. During the wet, cold, muddy winter months of December to March, when it would be inappropriate for the herd (and the pasture!) to be out in the fields, they get to come indoors where they are housed in 5 star accommodation, bedded on straw and fed preserved grass in the form of silage. Beef from Fortescue Farm is Red Tractor Assured. This farm assurance and quality scheme ensures that the cattle are raised in accordance with strict and comprehensive rules. When you buy beef carrying the Red Tractor mark, you can be assured that the farm has been independently audited and meets standards over and above the legal requirements. It certifies high welfare, veterinary care, hygiene and full traceability of where the meat has come from at every stage; as well as identifying the country of origin – so when you see the Union flag, you’ll know you’re buying beef from a British farm. We are blessed by stunning scenery and an incredible landscape in the south west. “Less Favoured Areas” is a polite term for land which is classified as ‘disadvantaged’ by the European Union. That is, land in which the terrain and climate can make it challenging to grow crops, which a walk on Dartmoor or Exmoor will make immediately clear. Around 47% of cattle in the UK are farmed on LFAs, as they have been for thousands of years. Retaining these mountains, moorlands, marshlands and meadows is essential for the environment, as they act as a “carbon sink”. Much of the stewardship of our countryside falls to the farming community, and the Greed family have been very active in this respect. Fortescue Farm is based on water meadows, and over the last three years, the farm has also engaged actively with Countryside Stewardship schemes and Upstream Thinking (with the Westcountry Rivers Trust), which supported moving to the zero tillage/mob grazing system. Despite huge demands on her time with everything else on her plate, Jilly co-founded Ladies in Beef with Minette Batters, current National Farmers’ Union president, in 2010. We asked her why – as a vet who grew up working with beef cattle and sheep in a similarly LFA in north west Ireland, Mrs. Otter Vale has never known a farmer with much spare time on their hands, and Ladies in Beef is a voluntary organisation of female beef farmers. 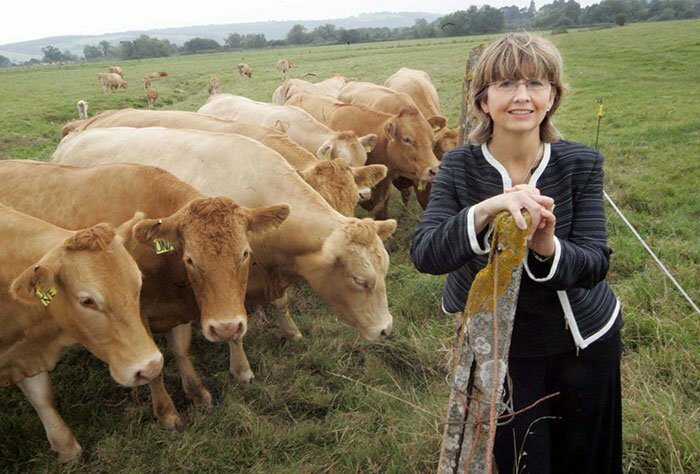 Jilly clarifies, “We felt the messages about the quality, versatility and nutritional benefits of British beef were just not getting through to consumers and we wanted to do something about it”. It’s clear that Jilly is passionate about producing quality beef, farming with flair, and spreading the word that provenance and standards count – and there and there are now 150 LIBs across the UK! We asked Jilly more about GBBW 2019, and why it’s so important. 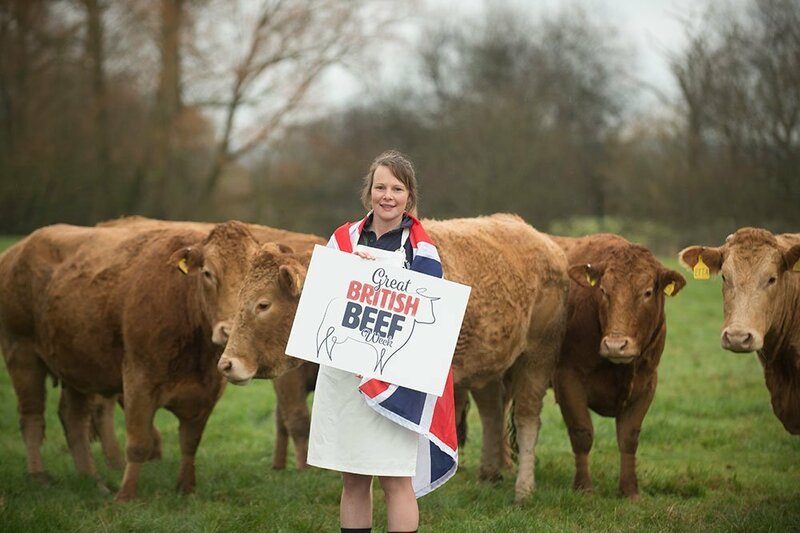 Alongside all the other benefits we’ve already outlined, Jilly adds, “This year, we’ll be championing that British beef is a very important part of the global diet, because of its quality, its nutritional and environmental health benefits. We also believe that GBBW gives you the opportunity to consciously consider how you source your beef, use their free recipe suggestions to add to your repertoire in the kitchen, and how you can make the best decisions according to your budget. Ladies in Beef have produced A Shopper’s Guide to Buying British Beef to help with that. Supporting your local butcher is a great way to find out more about provenance, welfare and quality, i.e. where your meat has come from; how it was looked after from farm to fork; and how it tastes. You might be surprised to find out that your butcher can often be a more cost-effective option, and you will be supporting your local economy. Even if you can only buy from your butcher once a year, try doing it during GBBW. We are very grateful to Jilly and her family and Ladies in Beef for being so generous with their time and information, and we hope you’ve enjoyed finding out more about where your food comes from, locally.